Abel Muñiz’s hacienda in the jungles of the lower Cosñipata Valley has been stitched together over the past six or seven centuries. Today the buildings are a homey mixture of wood, clapboard, stone, cement, palm thatch and corrugated iron. The hacienda features the same sounds and smells as farmyards the world over —ducks, sheep, cows, horses, pigs, chickens, geese, dogs, cats, rats, bats. In addition, the pets include a small caiman, a tapir, monkeys and parrots. Greta, Abel’s wife, first thing in the morning, used to go down to the sort-of natural swimming pool that they had made, to clean out any snakes and other fauna that TripAdvisor might make a fuss about. A pack of women and children swirls vaguely round the kitchen patio. The warm air is sliced every second by a thousand full-color and full-throated tropical birds. The distant rush of water over a set of rapids in the Rio Tono is a grey-noise background to the scritch and hum of a million insects and amphibians. Muñiz, a portly 60-year-old agronomist who tells a good story, says that the farm, Villa Carmen, belonged to Isabel Chimpuoccllo, a daughter of Inca Huayna Capac and the mother of Garcilaso de la Vega, the most famous of the post-Conquest chroniclers. Farms in the jungle in those days, as they frequently still do, produced coca. Today Muñiz keeps cows, has some ponds of carp, and takes tourists up the Rio Piñipiñi, the lowest reaches of which flow through his property after running down a section of the Pantiacolla hills in the Manu National Park. Lost city mavens will instantly have perked up at the name Pantiacolla. This is a favorite haunt of planners of expeditions to discover Paititi. Italians, Scots, Americans, and French have been there in the past five years, and there once was also talk of a big Russian-US-Spanish effort being planned. 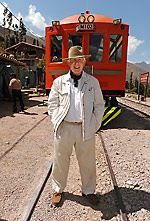 Not much was heard of Cosñipata till the 1960s when Alliance-for-Progress President Belaunde drew a line on the map between Cusco and Rio Branco, capital of the Acre Territory, the nearest town in Brazil, and called it an Intercontinental Highway. An army road battalion was sent off to Paucartambo, then as now a charming colonial sierra town with a stone bridge. 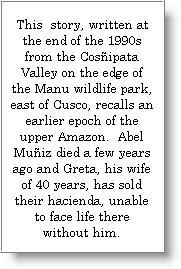 By the early 1970s, when I first knew it, Cosñipata was beginning to bustle with a frontier mixture of loggers, hunters, rice farmers, jeeps, missionaries, their Indians, gold panners and, in this case, the beginnings of the Manu Park. There is no region on the planet that breeds more illusions than the Amazon. I wish I had a lottery ticket for every exciting, challenging conversation in which I’ve participated about the potential of this jungle plant, that jungle animal and the other jungle valley. Muñiz is one of these enthusiasts. One afternoon the other week he took a pick-axe out to the forest near his house and came back with a big, yellow papaya-shaped vegetable that weighed in at 10 kilos. For supper it tasted like French-fried potatoes. Besides a hundred plants like Muñiz’s wonder-spud, the Amazon has, of course, a pharmacopia that is becoming, they say, better understood and appreciated nowadays. The best-known to appear in the past two or three decades in Peru is the uña de gato, cat’s claw, which is marketed extensively in Lima and everywhere else as a cure-all. But the most remarkable thing about the cornucopia character of the upper Amazon is the impressive contrast between the promise, the talk and the dreams, and the mud, the mosquitoes, the heat, and little else besides charm. Pilcopata, the jungle town a mile away from Villa Carmen, is a lot bigger than when I first saw it three decades ago. But it’s still a weedy, clapboard dump. The people are generally quiet, amiably unambitious and unaggressively disorganized. They know the jungle can’t be beaten, so they join it. But people like Abel Muñiz don’t. They lose Round One, Round Two and so on but they’re not going to give up and, damnit! they don’t. In a field a couple of hundred yards from the hacienda buildings is a remarkable, evocative sight. Here, in a clearing in the jungle, stands a large bi-plane, yes, a giant Gipsy Moth, quite new-looking. A tatter here, a bird’s nest there, but the tires are full of air. Against a backdrop of warm, misty, menacing jungle hills and a powerful river nearby, this is an impossibly romantic sight. Like most piston aircraft of the old school, the nose is way in the air, with a four-blade propeller. Inside, the fuselage slopes steeply backwards. One climbs up towards the cockpit, keeping an eye and an ear open for snakes. There are some Cyrillic signs in the cockpit and it takes no imagination to picture the pilot and co-pilot in those tight leather helmets and threatening oval goggles familiar from movies involving the Russian air force. The plane is, Abel Muñiz tells me over a warm beer on his kerosene-lamp-lit veranda, an Antonov Two. They’re apparently still in production in Poland at US$300,000 apiece, and in service there and in Cuba today. Its single nine-cylinder engine produces 1,000hp. It takes 15 passengers at a top speed of 170 mph, and a stall speed of 55 mph. Unloaded, it can land in 60 yards, and take off with up to 500 kilos in just 80 yards. With a full 1500 kilos load, it can take off in 450 ms.
Abel tells me —news you can use— that there is another half-dozen of these wonders scattered round the Madre de Dios and the northern jungle. They are the remnants of a venture only a decade ago when he did a deal with a Russian co-operative. “Started off pretty well. But what with devaluations and recessions, terrorists and drug people, and no tourists, it flopped. “My friends and relations thought I’d become a drug baron and insisted that I lend them hundreds of thousands. Of course, the police and the tax people were the same. It turns out that Abel’s Antonov II, the AN-2, also known as the ‘Annie’, was one of the great aircraft successes of the 20th Century. I learn this from a fascinating, first-rate article on Wikipedia which tells us that it is “the biggest single-engine bi-plane ever built” and that more of them, 18,000-plus, were built than any other aircraft, and has only just lost this record to the Lockheed C-130 Hercules. The An-2 started production in 1947 in NovoSibirsk, and was still being produced in Poland in the 1990s. It was simple to operate, powerful and could fly at incredibly slow speeds, like 30 to 40 mph, thanks to extendable slots on the leading edges of the wings, which functioned with rubber bands! Pilots learned to fly it so that it could land almost like a parachute and, in a suitable wind, backwards (over the ground). North Korea has a lot of AN-2s, it seems, and China produced thousands with its own modifications. With the breakup of the USSR, during the 1990s the AN-2 was sold, as it was to Abel Muñoz, all over the world for forestry, agriculture, ambulance, mapping, and there are a few in the U.S. which appear in air shows and for parachutists. For more, search for Antonov 2 biplane on Google. This article appeared in the Peruvian Times Feb. 15, 2013.